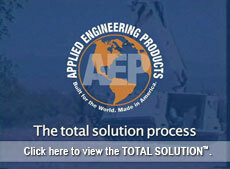 Applied Engineering Products is considered a leader in demining and demilitarization and security system implementation. Applied Engineering Products is pursuing opportunities currently in countries such as Turkey, India and Montenegro. The Utah-based business was founded to design, develop, manufacture, and deploy advanced technology for landmine removal, unexploded ordnance remediation, and security products for military, government and commercial end users. The Group has a unique combination of services and equipment, referred to as the Total Solution™ for mine action and security that will enable the revitalization of impacted countries. As a systems integration company, Applied Engineering Products handles business assessment, process and technology blending, solution architecture, and technology selection. We have built a consortium of technology partners that are best in class and span a wide range of solutions to support small, medium and large enterprises. Furthermore we have assembled a team of managers, technologists, and researchers from the fields of engineering, manufacturing, research and development, government contracting, lobbying, non-profits, and international distribution, sales, and marketing to accomplish our business plan.